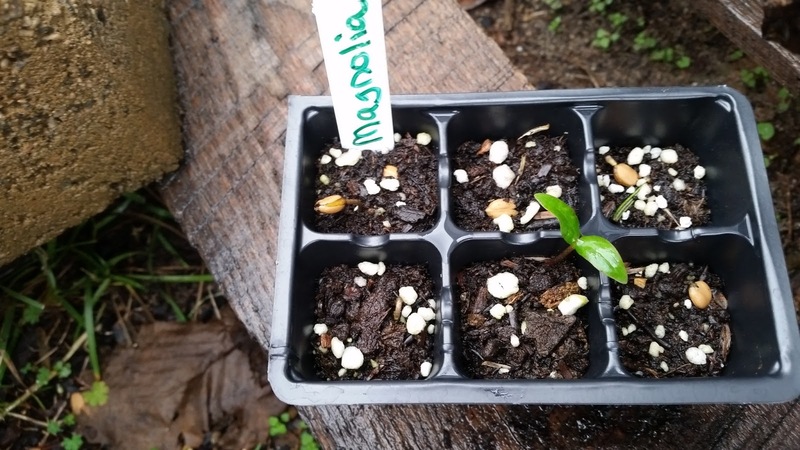 A few months ago, I soaked and peeled magnolia seeds and placed most of them in the vegetable drawers of the bee-supply refrigerator as I read that they need to undergo months of cold temperatures before they will germinate. I planted some directly in seed starter pots and left those outside the greenhouse to naturally go through the seasons. Apparently they don’t need 3 months of cold temperatures. The tender seedlings that sprouted in our abnormally high temperatures last week would probably not survive next week’s temperatures without the shelter of the greenhouse, but the few cold nights we’ve had this year followed by temperatures in the high 70s were enough to get them growing. While only one in the above picture has obvious leaves, two others are about to unfold leaves today. I pulled the containers out of the refrigerator and dumped all the seeds into an aluminum pan which I placed in the greenhouse. Two of the containers were bone dry and one had a patch of mold on top, so leaving the seeds out in the elements is clearly the better option for someone like me who doesn’t remember to check what’s in the refrigerator in the house, never mind the one in the garage with the bee supplies! I know I’m placing a lot of faith in the greenhouse, but we’ll see how well it fares this week with predicted record lows and two light bulbs burning in there overnight. The day time high in the greenhouse only reached 64 degrees today and the magnolia seedlings are not supposed to germinate until temperatures reach the high 70s, so I don’t expect to see 50 seedlings pop up in the next day or two! I really am far too impatient to be an effective gardener, but sometimes I’m pleasantly surprised — as with the 30 Goldenraintree seedlings that are still thriving. School starts again in two days, so I’ll be too busy to check the greenhouse five times a day. As well as the plants did without me for the past 10 days, I’m sure they can grow without me watching them!